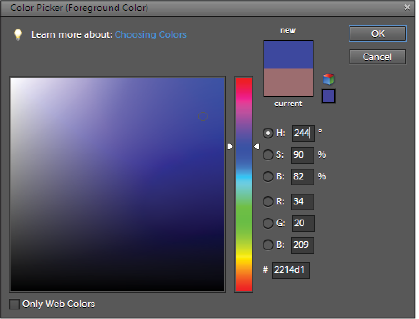 This tutorial provides you with a foundation for working with Adobe Photoshop Elements color. 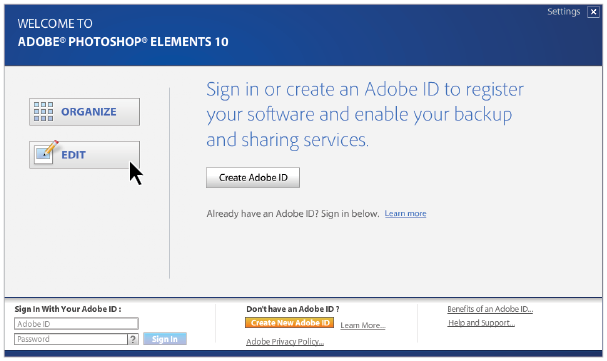 It is the fifth lesson in the Adobe Photoshop Elements 10 Digital Classroom book. Photoshop Elements has tools for easily adjusting the color and tonal range of your photos. You can adjust entire photos using global controls, or specific areas using selections. In this lesson, you’ll learn to adjust color using a variety of different methods. If you’re currently viewing the welcome screen, press the Edit button ( ) to enter the Editor workspace. If you are currently in the Organizer, click the arrow to the right of the Fix tab and choose > Full Photo Edit from the drop-down. Two different color models are used to adjust color in Photoshop Elements. The HSB (hue, saturation, and brightness) model is based on the way the human eye sees color. The RGB (red, green, and blue) model is based on the way computer monitors and other devices such as scanners and digital cameras display and capture color. The color wheel is another tool that helps you understand the relationships between colors. Photoshop Elements offers four image modes that define the number of colors displayed in an image: RGB, bitmap, grayscale, and indexed color. The human eye perceives color in terms of three characteristics—hue, saturation, and brightness (HSB). Hue refers to the color reflected from or transmitted through an object. 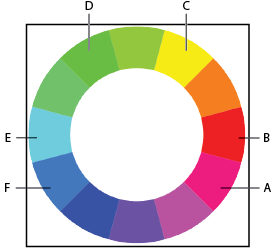 It is measured as a location on a color wheel, expressed as a degree between 0 and 360. In most cases, hue is defined by the name of the color, such as red, orange, or green. Saturation is the strength or purity of the color. Sometimes called chroma, it refers to the amount of gray in proportion to the hue, and is measured as a percentage from 0 (gray) to 100 (fully saturated). On a color wheel, saturation increases from the center to the edge. The brightness value is the relative lightness or darkness of the color. It is usually measured as a percentage from 0 (black) to 100 (white). In Photoshop Elements, you can use the HSB model to define a color in the Color Picker, but you cannot use the HSB mode to create or edit images. Use the HSB controls in the Adobe Color Picker to select colors. Most of the visible spectrum of color can be recreated by mixing red, green, and blue (RGB) light in varying amounts. These three colors are often called the additive primaries, because when added together, they produce white light. Where two colors overlap, they create cyan, magenta, or yellow, or subtractive primaries. RGB color is commonly used in lighting, video, and computer monitors. Your monitor, for example, displays color by transmitting light through red, green, and blue phosphors. The default mode of new Photoshop Elements images and images from your digital camera is RGB. Additive colors (RGB) are added together to create white light. Using a color wheel is a good way to gain a better understanding of the relationship between colors. Looking at the wheel, you’ll see that directly across from each additive primary (red, green, blue) is its complement: red/cyan, green/magenta, and blue/yellow. Further, each subtractive primary (cyan, magenta, yellow) is made up of two additive primaries. It does not, however, contain any of its complement. 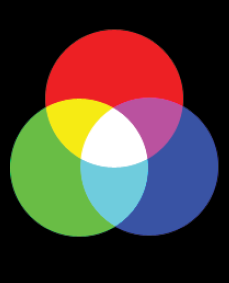 So, if you increase the concentration of a primary color in your image, you reduce the concentration of its complement. For example, cyan is composed of blue and green light, but there is no red light in cyan. When adjusting cyan in Photoshop Elements, you change the color values in the red color channel. By adding red to your image, you subtract cyan from it. Using a color wheel helps you understand the relationship between colors. A. Magenta. B. Red. C. Yellow. D. Green. E. Cyan. F. Blue.